Now that the kids of the ‘80s are grown up with jobs, disposable income, and fond memories of their childhood, toy companies are capitalizing on the nostalgia with throwback lines enticing them to re-buy all the toys they grew up with. 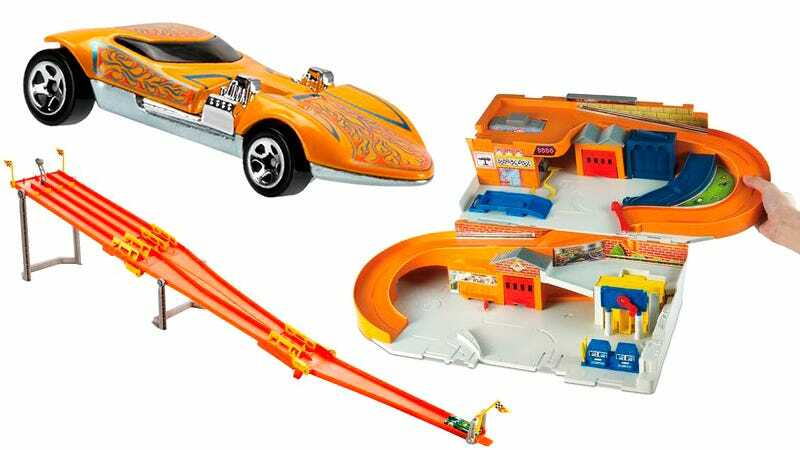 Next up is Hot Wheels, with a new retro line reviving some truly classic cars and tracks. If you were a child of the ‘80s with kids of your own now, you can finally introduce them to your favorite Hot Wheels toys that come complete with their original retro packaging. Your kids will probably be disappointed at the retro toys lack of mobile app connectivity, but let’s be honest here, you’re not really buying these again for them, are you? Nothing made a toy more appealing to a kid than being able to take it with them on boring car trips or agonizingly long visits with family. The $30 Sto & Go playset featured a double-decker design with a ramp that Hot Wheels cars could race down. It also featured lots of storage which was like kid insurance that your favorite cars never went missing. There was rarely any rhyme or reason as to why one Hot Wheels car was faster than another, but that didn’t make having the fastest car any less satisfying. Four cars can be pitted against each other on this $20 fold-up track, but only one will end up blasting past the finish line, triggering a pop-up checker flag. Most of us were happy to store our Hot Wheels cars in a recycled bucket of some sort, but other kids were fortunate enough to have a fancier way to transport their collection. There’s a modern version of the $15 Retro Hauler available now, but the classic version will always have a soft spot in our hearts since it transformed into a miniature drag strip for impromptu races. The only thing better than racing Hot Wheels cars is crashing them. Not only does the $25 Dash & Crash Speedway feature a pair of side-by-side loops (which might as well be magic to a kid) but the finish line sends the losing vehicle crashing off the track. It’s easy to find your favorite supercar, or over-the-top ride featured in the lastest Hollywood superhero blockbuster, as a Hot Wheels replica these days. But thirty years ago the line was more known for its original, and often unusual, creations. The more wacky your favorite Hot Wheels car was, the more street cred you had on the playground. And while today’s kids might scoff at a Hot Wheels car that doesn’t look like a Ferrari, that just means you’re free to decorate your desk with these 1:64-scale re-releases.